We just learned about the Maxillary Second Premolar. Another tooth in the human mouth is the Maxillary First Molar. 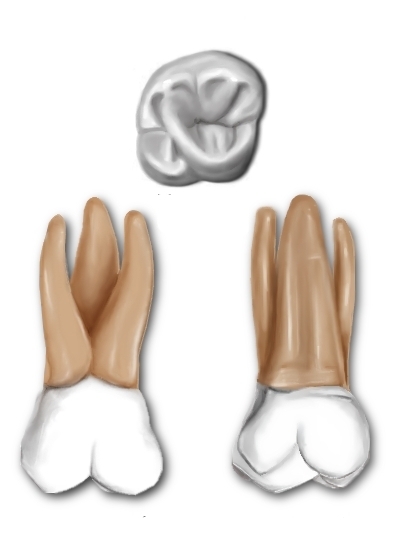 These teeth have cusps or pointy parts on them like the bicuspids, but they have four points instead of the two of a bicuspid. There are two cusps on the cheek side, and two on the tongue side. Sometimes people have a fifth cusp called the Cusp of Carabelli. Molars are used for grinding up food that is in the mouth. There are primary or baby teeth molars, but those are replaced by premolars. The adult molars show up further back in the jaw after the mouth gets big enough to have space for them. Aristobulus - bishop of Britain.